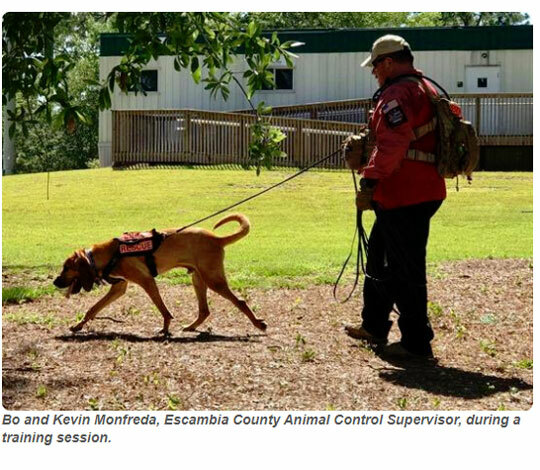 Each Saturday morning, Escambia County Animal Control Supervisor Kevin Monfreda and his 3-year-old bloodhound, Bo, visit campuses and parks along the Gulf Coast. The two aren’t stopping in for a game of fetch or a jog — they’re rigorously perfecting Bo’s skills as a scent trailing dog. The pair has been working together since July 2015, when Monfreda adopted Bo from the Escambia County Animal Shelter after Animal Control officers removed the 7-month-old puppy from an animal cruelty situation. “He was so cute, and we just really bonded,” Monfreda said. After two years of training and miles of scent tracking across various terrain, Monfreda and Bo are now certified by the North American Police Working Dog Association as a scent trailing team. The pair are now part of KLAASKids, a nationally recognized volunteer search and rescue organization that provides search managers, planners, field searchers and K-9s to search for missing and trafficked children. Monfreda and Bo have participated in three active searches for missing children. In addition to the weekly Saturday training sessions with other teams in the area, Monfreda and Bo attend regional seminars and training events. The two will attend their next seminar on Saturday, Nov. 10 in Sarasota, Florida, which will focus specifically on urban scent trailing. Another county working dog who got her start at the Escambia County Animal Shelter is 5-year-old German Shepherd mix, Britt. Britt was picked up as stray by Animal Control officers in 2015 and was taken to the Escambia County Animal Shelter and made available for adoption. She was adopted shortly after she was placed at the shelter, but was quickly returned. Officer Robert Oliver and Sgt. Boswell of the Escambia County Road Prison were visiting the animal shelter to check on an inmate performing work duties when they noticed Britt in her kennel. Oliver noted that dogs with an extremely high toy drive make great narcotics tracking dogs because of their relentless desire to find an object or toy. 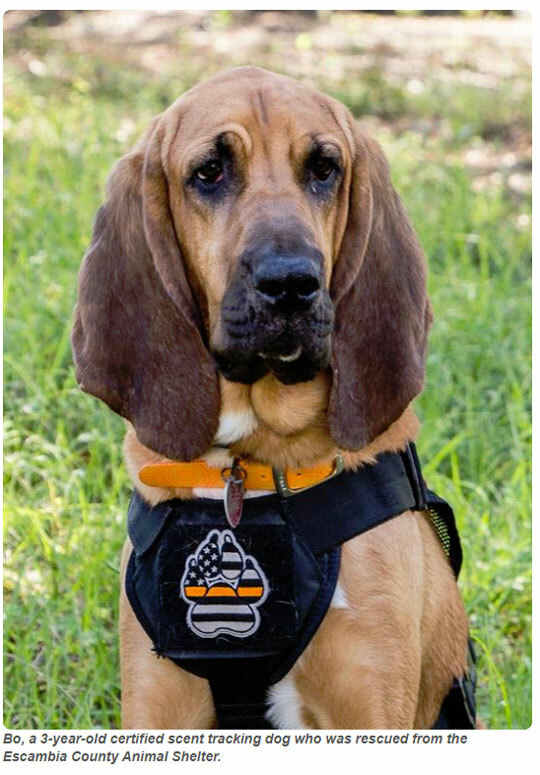 After seeing Britt’s toy drive and trainability, Oliver decided to pull her from the shelter to work as a narcotics dog for the Escambia County Road Prison. Oliver enrolled Britt in a training course with the Escambia County Sheriff’s Office, and she successfully completed 240 training hours and received her certification from the United States Police Canine Association. Britt now works directly alongside Oliver and searches areas where inmates live and work, including lockers, vehicles and various jail buildings. 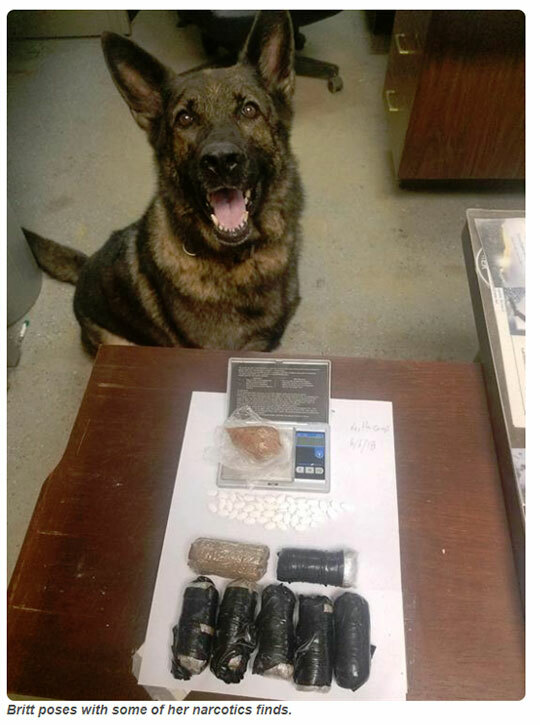 “She comes to work with me every day and while the inmates are working on the roads, she’ll do a housing area search,” Oliver said. The Road Prison also has four call beagles and one call bloodhound that make up the rest of the tracking team. 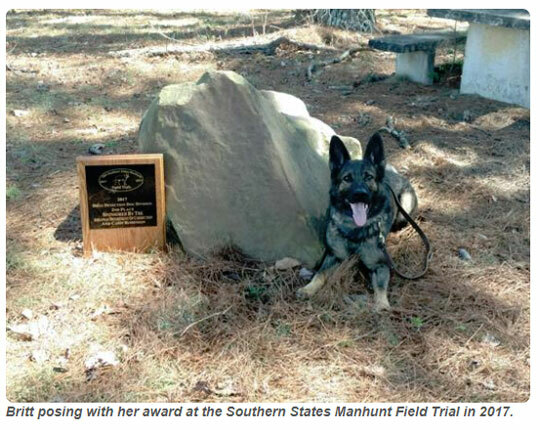 In 2016, Britt competed in the Southern States Manhunt Field Trial and placed fourth in the narcotics search. She returned in 2017 to compete in the same search and came in second place against 17 other dogs. Britt currently has 20 documented narcotics finds for Escambia County, and has found marijuana, methamphetamine, spice and prescription pills. “She’s a great working dog a and real asset to our team,” Oliver added. The two are preparing for Britt’s next Southern States Manhunt Trail competition in 2019. John Robinson, Animal Services manager, said his staff is always looking for dogs that come into the shelter that might make great tracking or search and rescue dogs.